Major (Ret) Brad Anderson is the Human Resources Manager at IHG Army Hotels – Fort Benning, Georgia. He retired out of the U.S. Army after 23 years of service with combat tours in Iraq (Operation Iraqi Freedom) and Afghanistan (Operation Enduring Freedom). Brad enlisted in the U.S. Army in August 1992, and was assigned as an infantryman at Fort Lewis, Wash., where he served six years in 9th Infantry Regiment and 25th Infantry Division. In 1999, he was assigned to Fort Benning, Ga., where he completed Drill Sergeant School and then served with the Infantry Training Brigade. He was next assigned to Officer Candidate School in 2003 and earned his commission as a second lieutenant in the Adjutant General Corps. 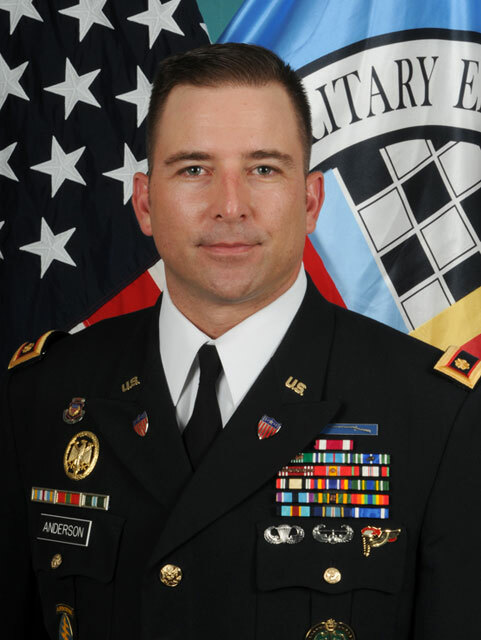 Major Anderson’s previous assignments as an officer include Camp Casey, South Korea, where he served as a postal platoon leader; Iraq, where he served as deputy plans and operations officer, III Corps; Fort Benning, where he served with 30th Adjutant General Reception Battalion, as Headquarters and Headquarters Company commander; Eglin Air Force Base, Fla., where he served with 7th Special Forces Group (Airborne), as battalion and group human resources officer and Fort Lee where he served his final assignment as the Military Entrance Processing Station (MEPS) commander. Brad’s professional military education includes the Adjutant General Corps Officer Basic and Advanced Courses, Airborne School, Air Assault School, Drill Sergeant School, Pathfinder Course, and Rappel Master School. He also earned a Bachelor of Arts Degree in Interdisciplinary Studies from Eastern Washington University, Cheney, Wash.
Brad’s military awards and decorations include a Joint Service Achievement Medal, 2 Meritorious Service Medals, 4 Army Commendation Medals, 3 Army Achievement Medals, and 4 Army Good Conduct Medals. He has also been awarded a variety of unit and service medals & ribbons, in addition to earning the Expert Infantryman Badge. On his first day of military retirement (October 1st, 2015) we proudly welcomed Brad to the IHG family. It was then, that Brad began his career with us as the HR Manager of the IHG Army Hotels on Fort Benning, a role he continues to thrive in today. Senior Master Sergeant (Ret.) Michael Bayerl joined the U.S. Air Force in 1979. Throughout 20 years of active duty, he served as an Air Force Services Specialist and Inspector General for Services-Air Mobility Command. 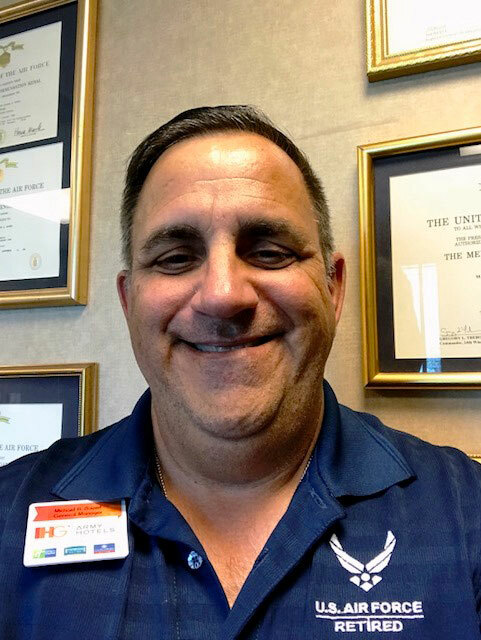 From the moment he started with the USAF Michael was immersed with hospitality experience, starting out in Food in Beverage before working his way through the ranks and functioning in virtually every position available within military restaurants & hotels. In 2002, Michael took on a General Manager position at an Air Force Inn, and since that time, he has managed hotel complexes with over 2000+ rooms, on 3 different properties. Michael found his way to IHG when he intentionally took on a role with Army Lodging, knowing that the hotel would soon be privatized into an IHG hotel. Today, Michael is the General Manager at IHG Army Hotels on Fort Lee (soon to be re-branded as the World’s largest Holiday Inn Express). Meet Teresa “Sarge” Colatarci, general manager/regional director of operations for six IHG Army Hotels at Fort Sam Houston in San Antonio. Following her service in the U.S. Navy, she continues to serve by providing True Hospitality through the IHG Teen Academy. *IHG® Rewards Club not applicable to Kimpton® Hotels & Restaurants; to be included at a future date. If you have a disability that prevents you from being able to search and apply for positions on-line, please email our support team with your request, including your contact information so that they can follow up with you.